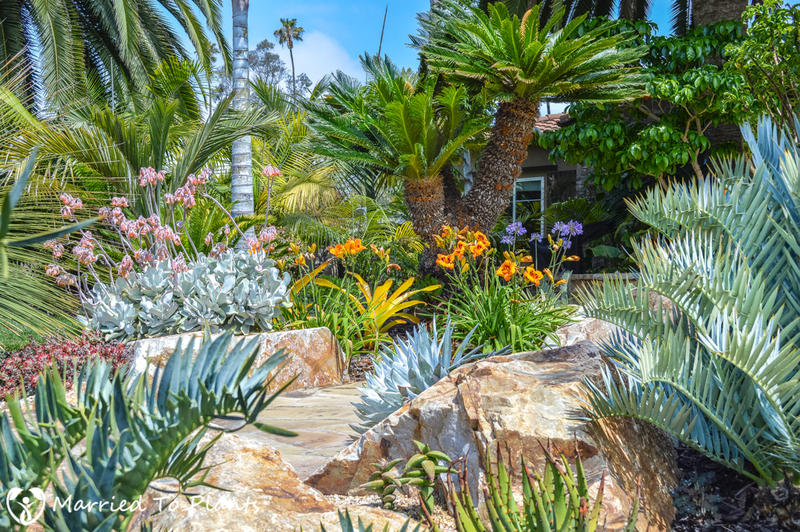 My garden is located in Vista, California, about 8 miles from the Pacific Ocean, at an elevation of 475 feet. It is classified as a USDA Hardiness Zone 10a, but I consider it a 10b, since I live in an excellent microclimate. I started building my garden in 2005 with the purchase of a new tract home. My home sits on one full acre that had been built up from a dirt fill where the developer leveled off a hill and filled in my plot. The previous land was a typical Southern California coastal sage scrub habitat. What I was left to begin with was a bare lot of dirt made up almost entirely of decomposed granite that had no organic matter whatsoever. I spent the next 6 years religiously adding compost and mulch to the garden beds. Thanks to hard work, what was once a curse has turned into some very healthy soil. I currently have about six inches of rich, black top soil sitting over my decomposed granite base. The soil is rich in nutrients where feeder roots grow, but fast-draining below. The result is a garden that no longer looks anemic without high fertilizer use. The very first time I saw a photo of a tropical landscape, I fell in love. Perhaps living in Oregon and Wyoming can do that to a kid. 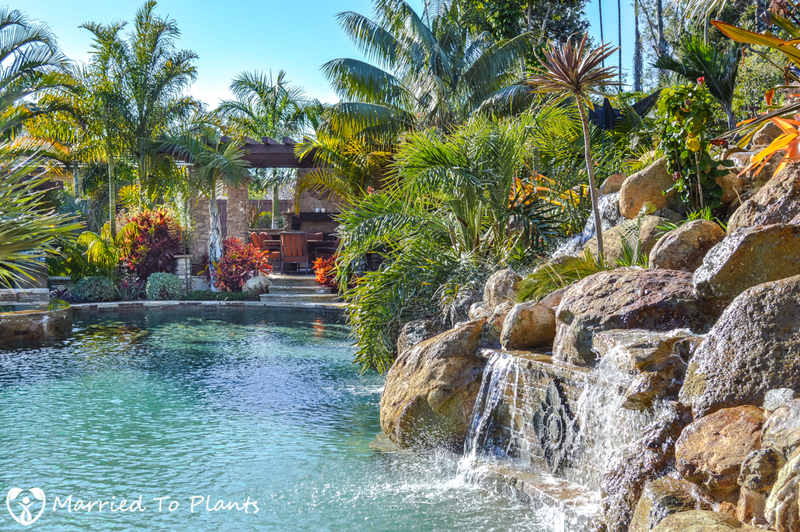 When my wife and I finally realized a dream and bought our first house, it afforded me the opportunity to realize another dream – to own a tropical paradise in my own backyard. 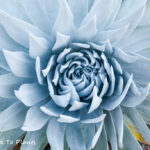 While working on my landscape, a neighbor of mine who works in the nursery business noticed I was gaining an interest in plants not typically found in a California yard. 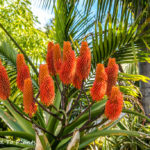 One day he introduced me to a few of his friends in the palm and cycad business, and I was immediately hooked. My OCD kicked in right away, and the hunt was on. 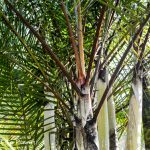 During that first year, I read every book I could get my hands on about palms, cycads and tropical plants. I searched all over the Internet and joined several forums. I wanted to learn as much as possible before wasting money and time on something I was new to. After that first year in spring, I started my purchasing phase – which has never stopped. Through research plus trial and error, I’ve slowly developed my garden into what I dreamed about over 10 years ago. 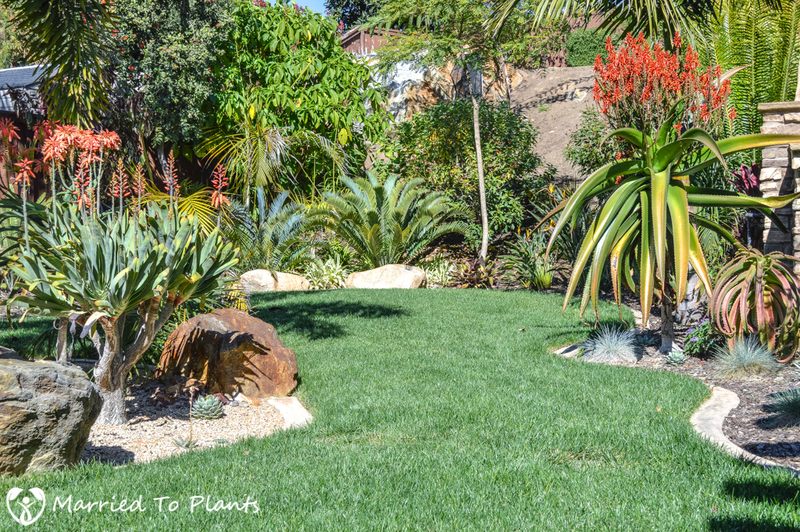 A Mediterranean climate provides so many wonderful gardening options. As an example, for me locally, it has been said that Vista, California is a “climatic wonderland”. 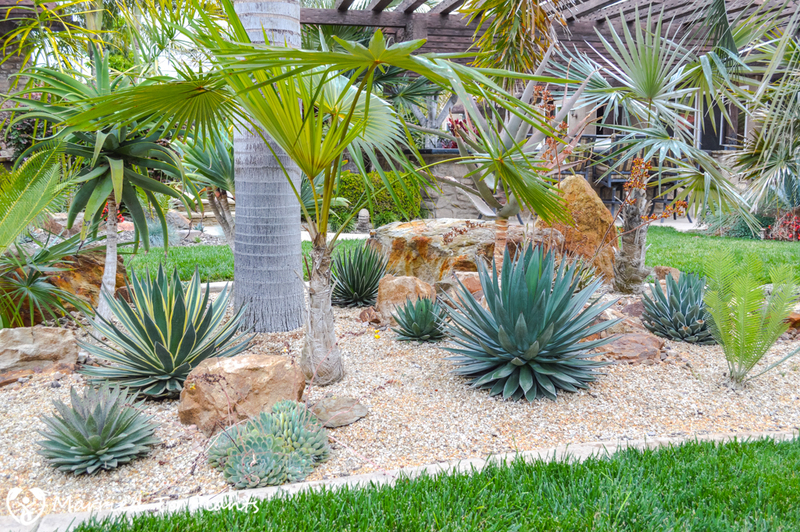 Thanks in part to its unique weather, where you can grow anything from tropical island plants to desert cactus. In fact ,Vista boasts one of the highest concentrations of nurseries in California. 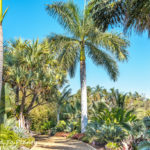 Here, you’ll find a few famous bromeliad and tropical plant nurseries – right next to some equally famous xeric plant nurseries. With so many options available to gardeners, why would we choose one style or plant group? 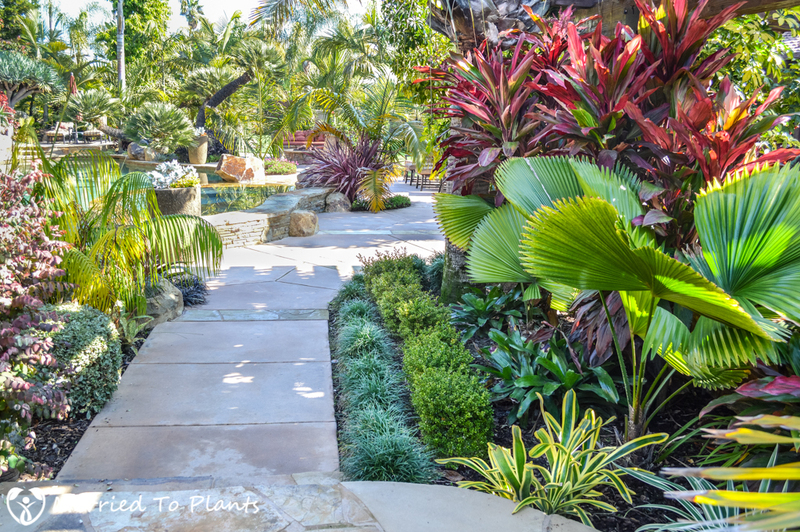 My desire for an all-tropical-themed yard vanished as my interest in the wide range of plants we can grow expanded. Over the course of a year or even a season, my taste change with the wind. 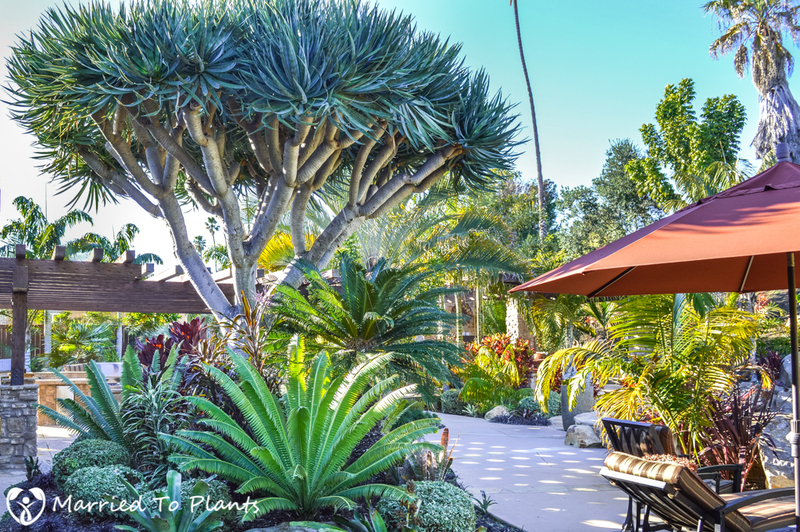 One minute, I was all about the palm tree, and the next, I was trying to find room for another aloe. Why fight it? So this is where the idea of California Fusion came from. The desire to grow all the amazing plants we can, and fit each of them beautifully into the garden. There really is no better way to appreciate and fully understand what you’re doing than growing plants from seed – and watching your seedlings blossom into majestic plants. It certainly seems to be a natural progression at some point, when the plant lover in you will germinate seed and raise his own babies. It was for this reason I built my greenhouse back in 2007. 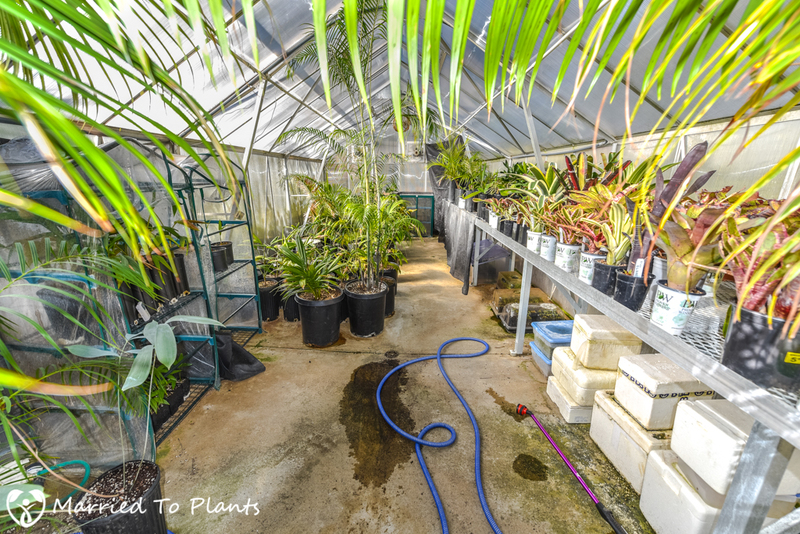 It started out as a way to help me grow many of the tender palms I was gaining interest in, but quickly evolved into so much more. Building the greenhouse turned out to be one of the best investments I ever made for my garden. Right now, the overwhelming majority of plants that end up in my landscape come from either seed I germinated, small seedlings I grew, or cuttings I rooted. Like anyone else’s garden, mine is in a constant state of flux. What I thought looked great a few years ago can fast become ripped out and begun anew when something just isn’t sitting right with me. I still have sizable bare areas needing to be designed and planted, but I just can’t seem to make my way around those areas. The cost and maintenance is an ongoing challenge, and one that will probably never go away. Now that I have kids in the world of “meets” and “tournaments”, precious free time previously dedicated to my garden dwindles. The process in place right now is to hit it hard in spring, maintain it through summer and fall, then relax in winter. Thank goodness for winter. I have no idea how people in the tropics do it year in, year out, without any reprieve at any time.